Gagandeep Singh, originally from India, shares his experience as a University of Arizona graduate student in UA Global's first International Student Spotlight. Read on to learn more! I would say Mount Lemon because of the sunsets. I don’t have a car so when someone else wants to go, we go as a group. The Rec Center. I work out and play games with my friends to de-stress. What has surprised you most about being here? The people are quite good. The hospitality in Tucson as a whole is good, probably because of the university community that it has. Where do you see yourself after graduating from the UA? I would like to work and get to know the working culture here, and then maybe go back to India to try to do something of my own. How has your time here at the UA impacted the way you see the world? I have met so many people from so many different countries. I used to travel a lot in India too, but here I am getting to know people from different religions, different regions, and different countries. You get more exposure to how people think and how people are. It makes you more open. You are opened to how other people feel, how they think. You might think that if I feel this way, then this is the right way. But then if you get to meet so many different kinds of people, you open up. You learn a lot from them. 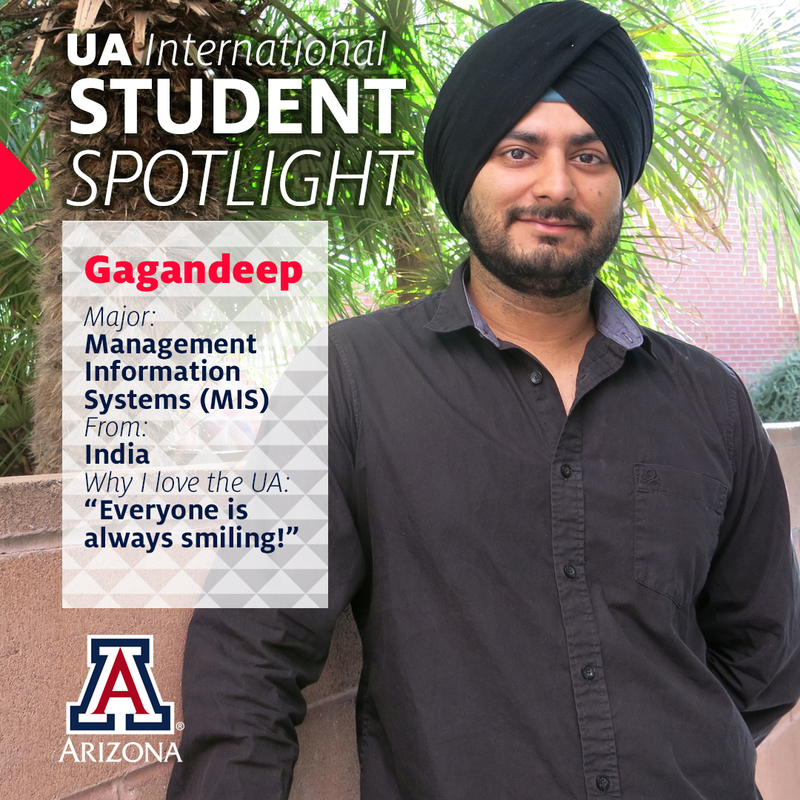 Learn more about Gagandeep and his experience in Arizona on the Global Wildcat Voices blog.